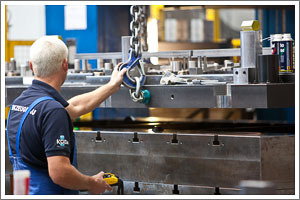 We offer the complete value chain: A motivated team, modern finishing technology, and a fixed contact person. From the CAD sketch to series production: you receive the entire support from one hand. We also hold ISO 9001:2008 certification. Our strengths: Precision and reliability. This is valued by national and international customers, particularly from the automotive industry. Our product portfolio ranges from cabriolet solutions to window lift systems. Metal processing from 0.3 to 8 mm and bandwidth up to 1.200 mm.